Garthside is a cul-de-sac of executive, detached houses on the south side of Church Road, opposite Ham Common to the North West of Latchmere House. The approval of plans to build these 10 houses all ‘detached and in a traditional style’ was reported on 18th July 1974 in the Richmond Herald newspaper. The company Focus 21 from East Molesey built the five bedroom houses, each with a double garage, and provided new vehicular access from Church Road. Garthside is built on a site where both Garth House and Warwick House once stood. Garth House: In May 1927 the architect Edward Partridge submitted plans to build a house next to Brown Gates (the house now called Cedarwood); his client was H. Lazell. The plans were for a house with five bedrooms, a box room and bathroom on the first floor and on the ground floor a drawing room, dining room and kitchen, all accessed via a large hall. It is likely that the client was Harold Lazell B.Sc. who had been the chief technician but later was appointed the joint managing director of Cellon Ltd of Richmond Road, Kingston. (Cellon’s factory was eventually replaced by the St George industrial estate). Cellon Ltd had manufactured paints and polishes for the aviation industry but later it developed products for other industrial markets; it was taken over by Courtauld in 1958. Cellon moved to its Richmond Road site in 1927, the same year that Mr H. Lazell’s plans were drawn. Until 1939 there were no entries for Garth House in the electoral registers and H. Lazell was never registered for a vote at this address. This does not rule out the building of the house prior to 1939 or his use of the property whilst having his principal residence elsewhere. The freehold land was listed in the 1949 sale of the Dysart family’s Ham and Petersham property and lands as Lot 121 with its annual rent of £55. This was considerably more that its neighbours along Church Road. Between 1939 and 1952 the house was home for a number of people, the residents changing annually. In 1953 Mr Horace Emery and his wife Ivy became the permanent and final residents. After Mr Emery’s death his widow continued to live in the house until the 1970s. 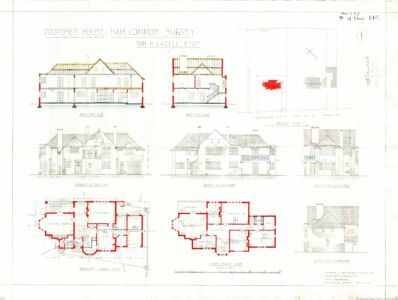 In the 1960s Mrs Emery had concerns about plans to build 10 houses adjacent to her own property and wrote several letters expressing her objections; as a result there were certain restrictions and conditions imposed by the council when the plans for what is now known as The Shires were approved. Warwick House: Although the date and design of this house is uncertain, it is known that it was built on a site between Garth House and close to the entrance to Latchmere House. It is not shown on the 1933 map of the area but its freehold was included in the 1949 Dysart sale as Lot 122 with its rental income of £35 pa. The electoral register first shows residents eligible to vote in 1939 when Mr Archibald Fox and his wife Gladys are listed; they lived in the house throughout the war years. In 1948 Mr Tanner Montagu Rogers and his family moved into the house and remained residents for some years. (It may have been a coincidence but Mr and Mrs Rogers had been married in Warwick). Mr Rogers had served as part of the Intelligence Corps during WWl. He was awarded an O.B.E. in 1918 and appointed District Production Officer, Aeroplanes for the Coventry and Birmingham area. The death of Mrs Rachel Rogers of Warwick House was announced in October 1951. Mr Rogers died in 1962, age 71. In 1964 the occupant of Warwick house was Mr Ferguson-Davie. On 20th June 1964 The Richmond Herald described how the drive of the house had been used as a set for the BBC2 thriller ‘Hit and Run’ directed by Paddy Russell. Copies of the interiors of the house were used as studio sets. The series was shown on Monday evenings during January 1965 and starred Joseph O’Conor, Rosalie Crutchley and William Dexter. On 1st April 1971 The Richmond Herald reported that plans to demolish Warwick House and build 8 detached houses and garages had been approved. However there was no building on the site until after 1974 when plans were approved to build ten houses on the sites of both Warwick House and Garth House; apparently both houses had been unoccupied for some time. The gardens of the Garthside properties abutting Church Road; that is numbers 1, 8, 9, and 10 (plus the front garden of Troll house built in the same style) were included in the 2004 extension to the Ham Common Conservation Area.